The great Swedish master looks into the mirror. 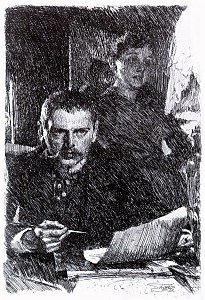 nders Zorn (1860-1920) occupies an enviable place in art history. His name is invariably included in an illustrious quartet of late nineteenth-century/early twentieth century masters of the art of premier coup (direct stroke) oil technique. The four names which are customarily linked are: John Singer Sargent (American), Joaquin Sorolla (Spanish), Giovanni Boldini (Italian) and Zorn (Scandinavian). Legion were (and are) the painters who have attempted this very difficult and demanding technique, but these four, working contemporaneously, were the standard-bearers of the discipline in their era. Painted at 29, this portrait vividly exhibits the Zorn trademark of extraordinarily free brushwork, with a decided rhythm of strokes blending from one form into another, across the edges or contours. The light here is falling from a high source (possible a skylight). This painting, like many Zorn works, includes a strong story-telling aspectthe young artist is shown in his studio surrounded by elements of his art: the back of a large stretched canvas and a sculpture work-in-progress. The working artist will note that the very evident brushstrokes all move in the direction of the form (i.e., down the lapels and the front of the coat, across the forehead and cheekbones. The story of Anders Zorn is one of a journey from poverty and anonymity to wealth and international fame. He was born February 18, 1860 in Mora, Sweden. Through the generosity of friends, he was able to enter the Royal Academy of Fine Arts in Stockholm, and at the age of 18 he sold his first painting, Zorn showed an early proficiency in portraiture. By the age of 22, Zorn had established himself as a professional portraitist in London. 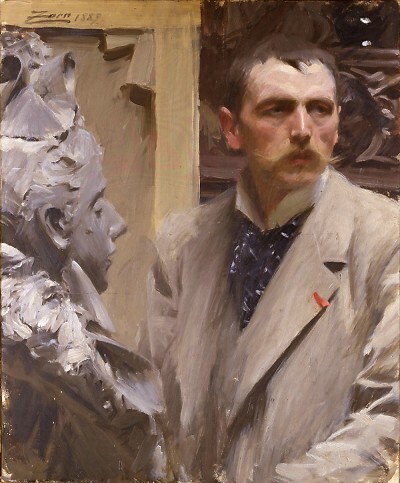 In 1888, Zorn, by then married, moved to Paris and made numerous friends, including Renoir, Degas, Rodin, and the Americans Sargent and Whistler. In 1893, Zorn made the first of seven trips to the United States, and developed a flourishing portrait clientele. Among his sitters were Presidents Cleveland and Taft. Zorn died at his home in Mora on August 22, 1920.